My second day of a Trinity Alps road trip started from the Swift Creek TH. Getting to is a somewhat longish drive of about 6.5mi one-way, but the well-signed USFS dirt/gravel road is in good condition for any vehicle. The road starts off SR3 just north of Trinity Center after one crosses a bridge over Swift Creek. I had spent the night at the TH and was up early, ready to go before 7a. I was equipped with snowshoes and crampons, but the latter were a pair of lightweight aluminum ones I took in place of the better steel ones that had broken the previous day. The Swift Creek Trail follows the creek on the north side for some eight miles before going over the crest at a saddle just east of Black Mtn. I intended to follow the trail for only a mile or so to the first trail junction at Granite Creek. It was just light enough to forgo use of a headlamp, but it would be several hours before I would see the sun. The Swift Creek Bridge that marks the start of the Granite Creek Trail is a sturdy one of steel and wood construction. The creek itself looked rather diminutive below the beefy bridge, but I suspect the drought conditions prevailing over the state hide the volume of water that this creek is capable of carrying. The trail was dry or at most damp for the first hour and a half, with the first snows appearing just below Gibson Meadow. Still, there wasn't enough to warrant the use of the snowshoes so I continued in just boots above the meadow and then past Granite Lake. 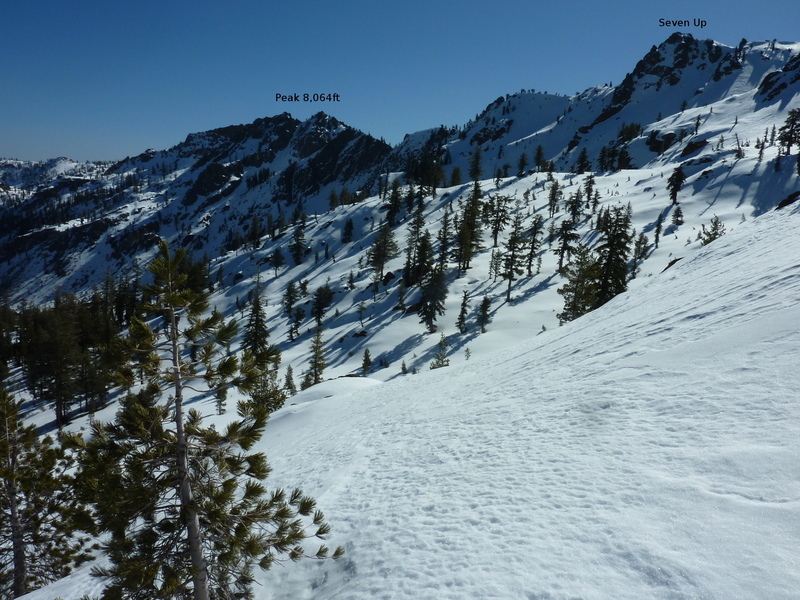 The shortest route to Gibson Peak is directly up the snowy slopes south of Granite Lake, but the uppermost portion of this route looked too steep and potentially dangerous in the aluminum crampons. I decided to stick to the trail and climb higher to see if the northwest side of the peak looked any better. I continued above the regular treeline into more open meadow areas, still brown from the previous season but with the snow melting off early. The cirque west of Gibson Peak was filled with snow and looked very steep - the way looked no easier from this side. Rather than persue some sort of epic on poor gear, I decided to leave Gibson untrodden on this trip and pencil it in at a future time when there was less snow or I was better equipped. Undaunted, I continued up the trail, soon donning snowshoes when the trail became buried in the white stuff. Even without a trail to follow, it was easy to find my way to the pass where the trail goes over it into the Stuart Fork drainage on the west side of the crest. I reached the saddle just after 10a, about three hours' effort. The west side dropping into Deer Creek and the Stuart Fork was all snow and inviting with a gentle enough slope but my attention turned northward for the final climb up to Seven Up Peak. The South Ridge was about half snow, half exposed rock/dirt/sand and held no real difficulties. It took about half an hour to top out on the rounded, snow-covered south summit with the higher point another 15min to the north. This had some rock scrambling with mixed snow which required slower travel to cover the relatively short distance. The summit rises to over 8,000ft, the highest I had reached yet in the Trinity Alps, though Thompson Peak, the highest in the range, goes up to over 9,000ft. To the northeast, about 2/3mi distance is another more daunting peak that is only about 50ft lower than Seven Up. At one time, it too had the Seven Up label, but that has now settled in the 7.5' version of the topos to the one I stood upon. Still, this other peak looked like a most worthy objective - just not one I was ready to tackle today. To the southeast rose Gibson Peak and it continued to look difficult with steep snow on all the visible sides. I needed a plan to consume the rest of the day and started looking around. A high peak, about 250ft lower than Seven Up stood to the north across Bear Basin about a mile and a quarter away. According the GPS it was unnamed. The nearest named summits besides Gibson were Mumford and Tri-Forest Peaks, further to the northwest. It seemed a worthwhile objective to go over to the unnamed one and it was to this that I turned my efforts. I returned to the lower south summit and then down the NW Ridge. I had some concern that I might run into cliffs here, but was happy to find smooth sailing (and slopes) lined with snow that could be easily descended on snowshoes (from below it was clear than much of Seven Up's north side would have been too steep to consider). I descended to a saddle between Peak 7,864ft and Seven Up that separates Bear and Black Basins. From there I followed the South Ridge, a mix of rock and snow sections, up to the top of Peak 7,864ft where I arrived around 12:20p. This easy summit anchors the south end of Mumford Basin with a collection of named summits to the northwest on the border between Siskiyou and Trinity Counties. They were too far for me to consider for today, but perhaps another visit. I decided to explore north into Mumford Basin and perhaps, if I had the energy (I wouldn't), a visit to Mumford Peak. There are more cliffs and steep terrain unsuited for snowshoes on the north side of Peak 7,864ft, but I was happy to find a very nice descent line into the basin starting a short distance down the NE Ridge. It had a gentle enough slope and was conveniently lined with snow to make the decent a snap, at least until I got closer to the bottom of the basin where I removed the snowshoes and found a mix of talus and mild brush to contend with before reaching the brown meadows of the basin. Heading north out of the basin through forest towards Swift Creek, I found more mild bushwhacking before stumbling upon the unmaintained Mumford Trail further down. I followed this for a while before losing it near Swift Creek, only to pick it up again crossing a meadow to its junction with the Swift Creek Trail. From this point my route would be all on maintained trail, dropping less than 2,000ft over the course of seven miles, a mostly gentle gradient. I passed through Mumford Meadows and the last of any significant snow. The Swift Creek Trail has a number of forks along the way and appears to be popular with stock animals, making it less pleasant than a maintained trail might otherwise be. Fosters Cabin is found just above Parker Meadow, a fairly large wood structure that has survived more than 100yrs. At the junction with Parker Creek I failed to read the signs correctly and missed the maintained route across a footbridge a short distance above the confluence. Instead I followed the old trail through a washed out section before rejoining the correct route a little ways down Swift Creek.